Make a note in your diary to join in the fun. To take part is as simple as A,B,C. We care that the Yellow Sea is being devastated. We care that 80% of UK Northern Lapwings have disappeared. 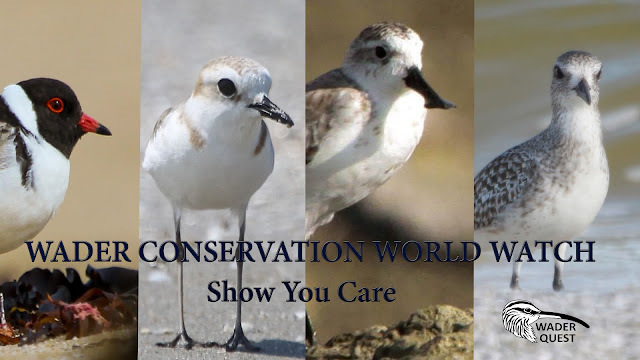 We care that the Spoon-billed Sandpiper is heading for extinction. 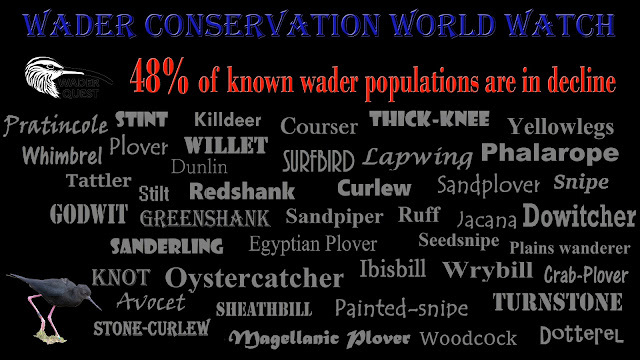 We care that 48% of known wader populations are in decline. We care that hay meadow nesting chicks are being destroyed by early mowing. We care that thousands of waders are still hunted. We care that Hooded Plovers still can't find a place on the beach to breed. We care that wetlands are being drained. We care that 97% of Irish breeding Eurasian Curlews have gone. We care that Black Stilts only cling to existence due to captive breeding. We care that 6 wader species are Extinct. 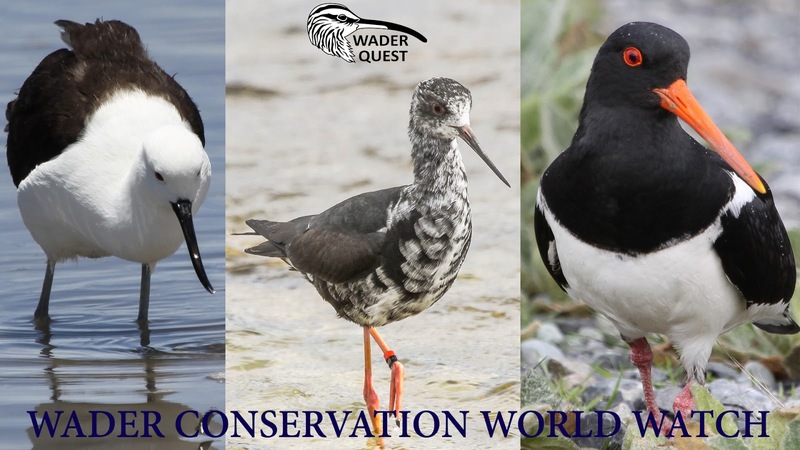 We care that 8 wader species are Critically Endangered. We care that 4 of those are probably Extinct. 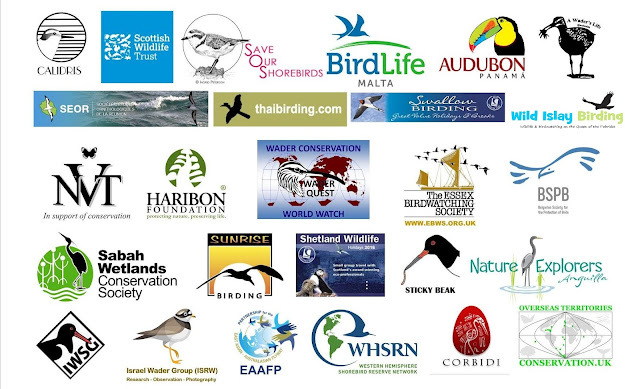 We care that 9 wader species are Endangered (2 new recently). We care that 9 wader species are Vulnerable. We care enough to stand up and be counted. If you are part of an organisation which wishes to support the project please get in touch and we'll add your logo below. Note: For our purposes there is no necessity to count the birds however if you are willing and able to do so we would encourage you to enter your lists on public databases such as eBird and BirdTrack to add to our general knowledge of wader distribution and population levels. In particular we would be interested to hear about any colour-ringed or flagged birds, information that may be of some interest to researchers. Hooded Plover, White-faced Plover, Spoon-billed Sandpiper, Grey Plover. On 6 continents in all 9 flyways. And here is a list of the species seen and the Roll of Honour. Congratulations to Mike and Rose Clear of NSW, Australia who received a signed Lars Jonsson wader poster and a set (Nºs 1-8) of Wader Quest Collectables wader pin badges. Eurasian Golden Plover Pluvialis apricaria: Titchwell RSPB reserve, Norfolk, England. 30/11/2014. Today 1st November 2015 at my local reserve Upton Warren Worcs UK . Northern Lapwing 200, Curlew 6, Common snipe 51, Jack Snipe flushed just feet away, Green sandpiper. a quiet time of year for waders on the reserve with no passage birds present. Thanks for your list for yesterday, the world watch is on the 7th and 8th, it was a goodly list though, especially since you saw a Jack Snipe, will you be able to repeat the exercise for next weekend, hopefully the Jack Snipe will still be there! Fingers crossed and thanks gain for your interest. Looking forward to a cold front hopefully bringing some fresh waders to the New York City area this weekend. Here´s hoping Dominic! Thanks very much for your support for this event. Cheers! Please let us know by email if you can we may miss it here! Thanks.